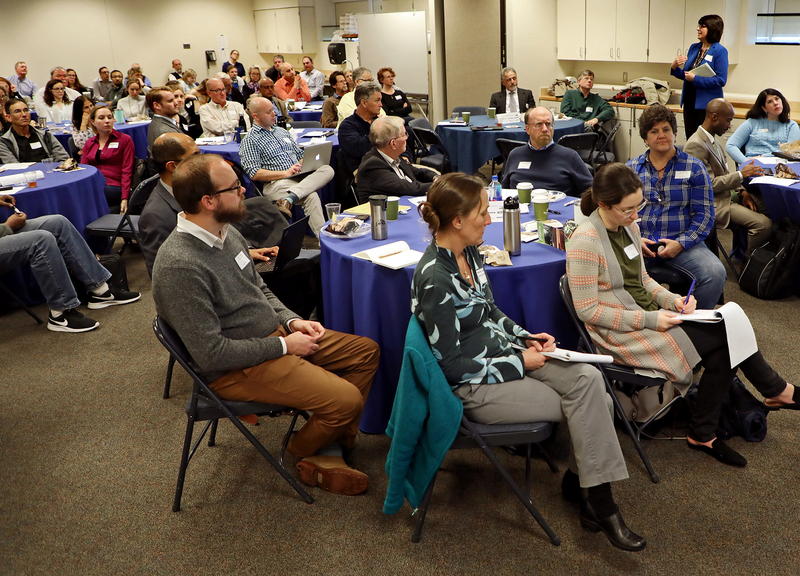 Surrounded by centuries of maritime tradition, regional professionals gathered for the winter Hampton Roads Adaptation Forum on Feb. 22 at the Mariners’ Museum. 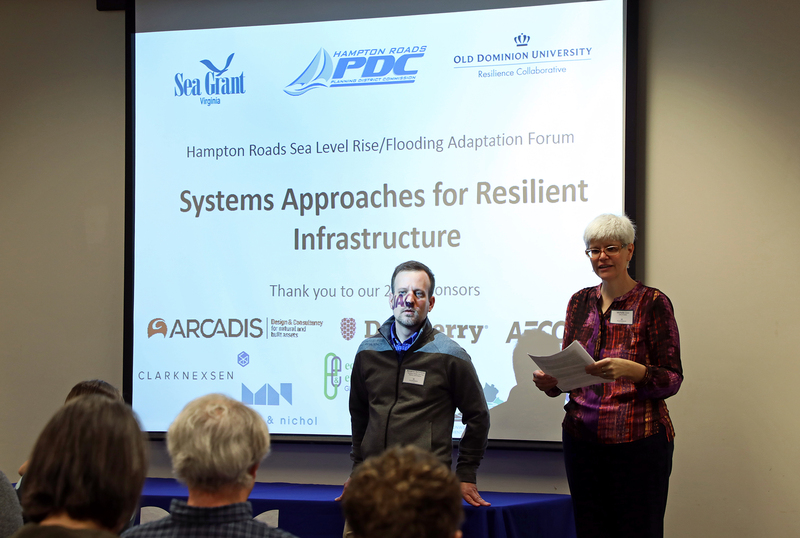 The Forum brings together a diverse group from Hampton Roads interested in resilience—city planners, academic researchers, private-sector firms, civic league members, and nonprofits. Sometimes, resilience planning can be as much about smaller, short-term adjustments as it is about larger-scale projects. When Robert Allison looks at improvements for Dominion Energy’s power substations, small, short-term changes can add up. But for the buildings that will be exposed to future storms and water levels, the codes governing their construction need be future-oriented, too. Mampara discussed New York City’s climate resiliency design guidelines, which the city released in 2017 to establish a set of standards that consider future climate conditions. Plumbing codes must accommodate higher water levels, and mechanical systems like central heating and cooling might need to compensate for heat islands that develop in urban areas. “There’s a diversity of professions that need to be conversant and apply this information,” Mampara said. As a part of the assessment, New York City also used case studies of EMS stations, libraries, water treatment facilities, and plazas to do a cost-benefit analysis of implementing green designs. From the Hampton Roads area, Steve Poe, an engineer for Virginia Beach, discussed the city’s comprehensive risk assessment and master-plan analysis that took place over the last four years. They also calculated the cost of doing nothing, amounting to roughly $12 million per year in structural and economic losses. Out of the study, the city developed about 10 different potential alignments for structural protection that the city is now evaluating. Sometimes, a promising solution solves the wrong problem. Such was the case for a four-foot seawall designed for the City of Virginia Beach. Ultimately, the proposed design was rejected in favor of a lower, less protective wall that didn’t interfere with waterfront recreation. The example highlighted the importance of stakeholder perspective—a factor that can have just as much impact on resilience design as building or engineering codes. Pezza discussed the importance of considering community worldview when tackling complex issues like sea level rise. Later on, Cindy Shurling and Katie Guttenplan from Ecology and Environment shared practical tips for community engagement based on their own outreach. They emphasized that going the extra mile to engage communities builds trust and opens doors for sharing information. Part of community engagement also means tailoring the message to a specific group—whether that means holding meetings that accommodate different schedules, or creating infographics to put information in a user-friendly format. "There’s a diversity of professions that need to be conversant and apply this information." While working on automobile designs, Henry Ford once quipped, “If I had asked people what they wanted, they would have asked for faster horses.” Despite the murky history around Ford’s quote, it rings true that today’s realities can blind us to tomorrow’s possibilities. “It’s about asking the right questions, and trying to understand the future,” says Edgar Westerhof, the national director for flood risk and resiliency for Arcadis-North America. When dealing with water, this can require “redrawing or withdrawing,” as Westerhof puts it. Westerhof gave an overview of resilience issues from other cities in the 100 Resilient Cities network. For cities like New York, water management measures must also withstand cold winter temperatures. For cities like Honolulu, this means dealing with small fish in the streets after rainstorm flooding. Westerhof emphasized that adaptation strategies also can be harnessed as a way to revitalize urban areas. One such opportunity for blending resilience with rejuvenation is the Yards West District in Washington, D.C. The area, once used for shipbuilding and weapons manufacturing, is being restored as a walkable neighborhood. Claire Bedat of AECOM discussed the design plans for the neighborhood—one of the sole areas in the district where the riverfront is walkable from a metro station—to demonstrate how placemaking can be combined with resilience planning. The Hampton Roads Adaptation Forum brings together a variety of professionals to share knowledge about best practices in adaptation. The February Forum focused on resilient design and discussed city codes, long-term and short-term planning, the importance of community outreach and buy-in, and the power of placemaking. The Forum is a collaboration between Old Dominion University, the Hampton Roads Planning District Commission, and Virginia Sea Grant. Despite the murky history around Ford’s quote, it rings true that today’s realities can blind us to tomorrow’s possibilities.